A comfortable and ideally located family-friendly hotel, Kefalonitis Hotel Apartments makes for a great base from which to explore Paphos. Rooms are spacious, comfortable and well-furnished. Kefalonitis Hotel Apartments is just 12km from Paphos International Airport. It is also just a stone’s throw from the nearest beach and lazing under the golden Cypriot sun and the warm waters of the Mediterranean Sea. Several world-renowned historic sites are must-see sites, including the Tombs of the Kings, Paphos Archaeological Park and the Medieval Castle all located along the coast and easy to reach. There are a host of incredible restaurants, tavernas and bars, many of which afford visitors with views over the sea whilst you eat and drink. Adults and children alike will have great fun at Paphos Waterpark whilst the nearest golf course is just a 15-minute drive. 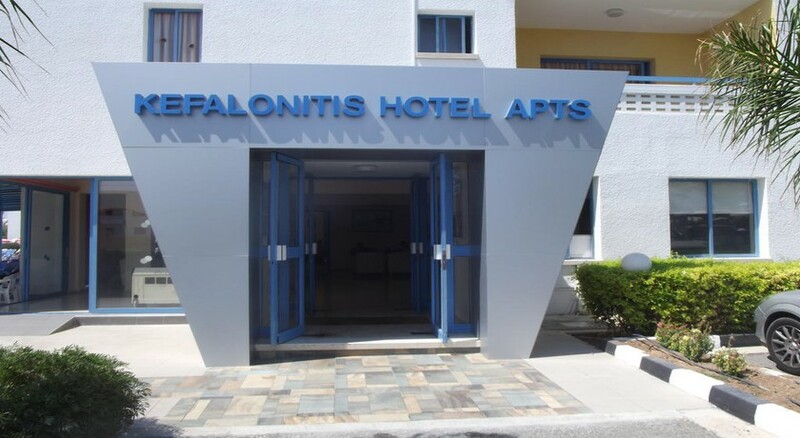 Kefalonitis Hotel Apartments is situated just a short distance away at 12km from Paphos International Airport. The beach is less than 500 metres from the hotel, so you can reach it in no time. The historic Old Town of Paphos is less two miles away as are historic sites like Tombs of the Kings and the Archaeological Park. Restaurants are easy to come by and offer international cuisines such as Italian and Japanese to local Greek and Cypriot dishes. 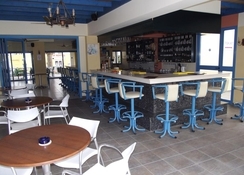 There are a number of bars close to the seafront which overlook the Mediterranean. Paphos Waterpark is just a few minutes drive south from the hotel and many shops for both food and retail shopping are within walking distance. There are 72 rooms and apartments at Kefalonitis Hotel Apartments all are beautifully designed for its guests. They feature standard amenities for a comfortable night’s stay such as air-conditioning, wi-fi, T.V., private bathroom and much more. The apartments are more spacious more extensively furnished and are ideal for larger groups of family and friends or for spending an extended period away. These feature a kitchenette furnished with amenities such as fridge, microwave, oven, kettle and more. 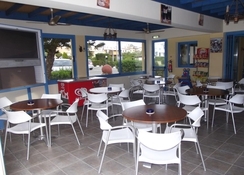 Though Kefalonitis Hotel Apartments doesn’t have a restaurant on site, however, there are snacks and drinks available at the café and bar by the pool. There are a great variety of places to dine out in Paphos, it’ll only be a challenge to decide where to go for your meal. Dias Zeus is practically next door to Kefalonitis Hotel Apartments and is top spot to try authentic Greek cuisine. A little trip north and you’ll encounter Karlina’s Restaurant, which has a little something for everyone with international classics, local favourites, a children’s menu and vegetarian options. If you fancy a drink in the evening then head south down the main road of the hotel and you’ll barely be able to go a few feet without finding a great bar with a great view over the sea. 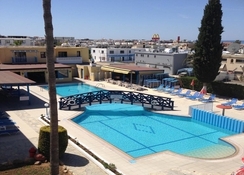 Kefalonitis Hotel Apartments has both an indoor and outdoor pool with sun loungers and parasols. Guests will be able to take to the tennis court, rock up at the gym and relax with mini-golf. The hotel’s spa provides a sauna and massage, perfect ways to unwind on your holiday. The hotel is in a prime location to visit the world heritage site of the Tombs of the Kings. Meanwhile, just a mile south is the Paphos Archaeological Park and Medieval Castle both which give visitors an insight into the amazing history of Paphos as well as being situated right on the coast. Paphos also has two water parks and a museum as well as nightclubs for guests who want to party the night away. 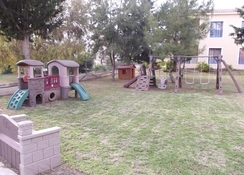 12km from Paphos International Airport.